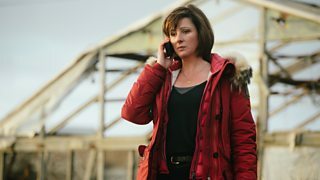 BBC Blogs - TV blog - We ask Hinterland’s Mali Harries: What is it with the red parka? Think of crime drama Hinterland, and a few things are bound to come to mind. The mysterious, impressive backdrop of the Ceredigion countryside. The ever-present feeling of tension mounting. And DI Mared Rhys' bright red coat. The story of the red coat is as follows. Marc Evans, the director of Hinterland's first episode in 2013, wanted my character, Mared Rhys, to have a parka jacket. Hubert Tachanovski, the director of photography for the first series, wanted a bright colour, so that in the very wide shots of the landscape, you could easily spot Mared out of the green, greys, and browns of the land. Ffion Elinor, Hinterland’s costume designer, wanted a bit of fur (fake, obviously). And I wanted something that could keep me warm during the snow, hail, wind and rain. So the red coat that Ffion eventually found brought all these ideas together. A lot of fans ask on Twitter where the coat is from. It's actually an Italian make, and is brilliant. The coat has a certain following, and I call it a ‘she’, as she is beautiful and strong, weatherproof and brilliant. As regards to her having her own Twitter account, I am very surprised that she doesn't have one. In episode four (in 2014) where I wore a cream version, some people felt it wasn't right. In a way, the coat is Mared's uniform, as if to say: "I'm ready for anything, bring it on. Rain, wind, hail, snow." And certainly filming in Ceredigion for such a long period of time, we will encounter all sorts of weather. With regards to her being a character in her own right, she is welcome to have all the adventures she deserves. Hopefully she can be auctioned off for a charity at the end of the series. I personally would steer clear of wearing a big red parka in future, as I feel it would spoil my disguise in real life. Normally I don't wear make-up and I tie my hair back, so wearing a similar coat would blow my cover somewhat! Although I have bought a few coats from the same company, as they are so well made. Buy cheap, but twice I always say. If I was to buy Mared a new coat, it would have to be extremely warm and comfortable, but maybe a little more fitted for when the seasons get warmer. 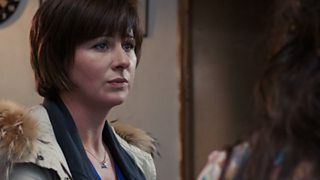 Mali Harries plays DI Mared Rhys in Hinterland. 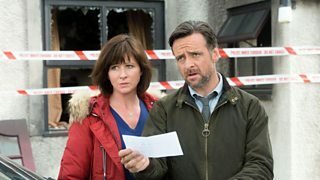 Hinterland, series two continues on BBC Four on Saturday, 30 April at 9pm. The series was first broadcast from Wednesday, 6 January at 9pm on BBC One Wales. 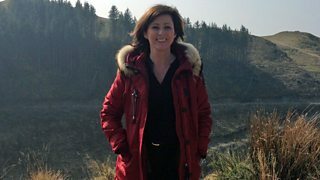 The series will be available to watch from everywhere in the UK in BBC iPlayer. Each episode is available for 30 days after broadcast on TV.